Black and white cookies are delicious when light, moist and redolent with lemon flavor and scent. My wife is a teacher and asked if there was anything I could bake to represent Martin Luther King, Jr day. After discarding many ideas, we concluded Black and Whites would be appropriate as a sweet treat for her classes. Though in the final execution, some of them look more Yin-Yang looking than half moon, they taste great, and it’s possible that if people are eating something yummy, they’ll be more receptive to learning. In any case, my part of the curriculum ends when the cookies are done. Black and White cookies have always been something I’ve wanted to make well, but until this batch, I’ve never succeeded in making them taste as good as the ones I had growing up in New York. And in New York, great ones are everywhere. Whether at your favorite red-and-white string bakery or facing down a 2AM sugar urge at a nearly-abandonded bodega, they were consistently delicious: moist, light, redolent of lemon and just the right smidgin of crackle in the icing. When I moved to Boston I noticed they didn’t make them the same here. They were crumblier, and almost always used frosting on both sides or sometimes just the chocolate side. They were fat, and consistent with their name “Half Moon,” but not like the big almost sugar-cookie shaped delectable we often got at Zabar’s. In Massachusetts there seemed to be no parameters constraining their size; in New York there were mini black and whites and regular. Nothing in between. And that’s how we liked it. Most of that has changed; you can find “NY Style” black and whites here in Boston proper now, and they sell pretty good ones in nearly any suburban supermarket. However, my need to make them well was still powerful, and a request from my wife was all I needed to try again. I did use the Zabar’s recipe (printed in my favorite New York cookbook and the NY Times) as the base, but also consulted with the Joy of Baking‘s version, which was similar but had a few more interesting ideas. I found it necessary to double the vanilla (always) and double the amount of lemon extract. It seemed using the prescribed amount ended up with no lemon smell or taste at all, and it is supposed to figure prominently in the flavor. There was also an issue with the chocolate color. Just using semi-sweet chocolate (chips, for instance) and adding to the frosting resulted in a light-brown color, but the New York style are nearly black, so obviously something needed to be done. I found that adding cocoa powder neatly darkened the chocolate and in addition helped it retain a nice chocolate taste. Lastly, the corn syrup was necessary to keep it all not just spreadable but smooth. My first few were not smooth and but I realized how to fix that and then I was happy. In terms of the cookies, because the recipe described using “just enough flour to make them workable,” I held out about a half cup of the flour mixture from the final product. This I think resulted in a lighter, less dense cookie. The only other thing to note was that the cookies, to be true new york style should be flat, not half-spheres, so if you’re aiming for complete fidelity, the ice cream scooper might not be what you want. I found silicon mats and parchment paper worked equally well. 1. Preheat oven to 375 degrees. (I found this recipe required more than two baking trays). 2. In a stand mixer, combine sugar and butter. Mix until fluffy. Add eggs, milk and vanilla and lemon extracts, and mix until smooth. 3. In a separate bowl, combine cake flour, all-purpose flour, baking powder and salt. Stir until mixed. Add dry mixture to the wet, DO NOT OVERMIX. Using an ice cream scooper, place heaping spoonfuls of the dough 2 inches apart on the baking sheets. Bake until edges begin to brown, 18 to 20 minutes. Cool completely. 1. Place confectioners’ sugar in a stand mixer. Gradually stir in just enough boiling water to the sugar to make a thick, spreadable mixture. Add corn syrup and vanilla and a pinch of salt. Adjust all those ingredients to taste. You don’t want a grainy, sugary texture. 2. Add 1/3 the frosting to the top half of a double-boiler where you had previously melted the chocolate and corn syrup over simmering water. Warm the mixture, stirring, until chocolate is melted and frosting is smooth. Turn off the heat, but leave chocolate frosting over hot water to keep it spreadable. I used a spreader to coat using the vanilla, then a spatula to finish “smoothing” the warm chocolate side. Let sit (if you can) to harden. Let dry before eating, if you can. I found the cocoa powder necessary to get the right chocolate color and the corn syrup to make it smooth. Yield: 2 dozen large cookies. 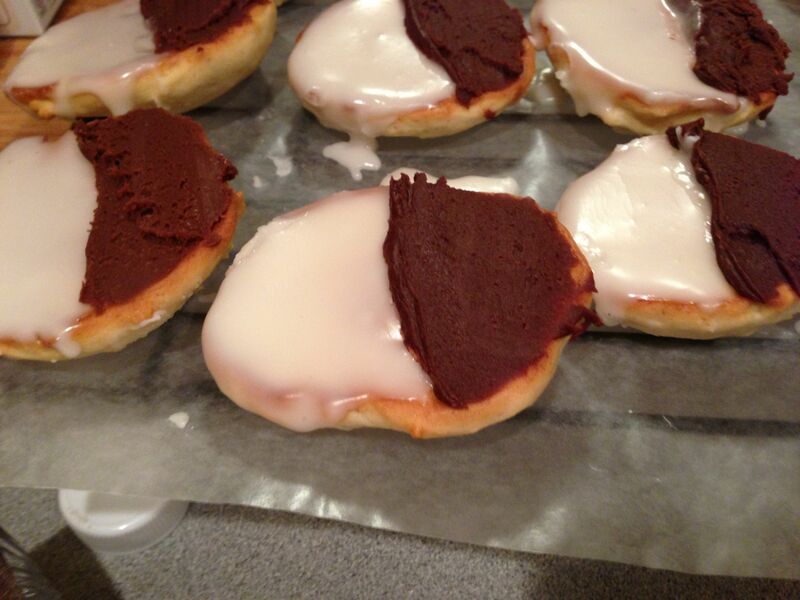 Posted in Desserts and tagged baking for harmony, black and whites, cookies, Half Moons, martin luther king day, New York Baking, New York Style Black and White Cookies on January 19, 2015 by Robert Deutsch.